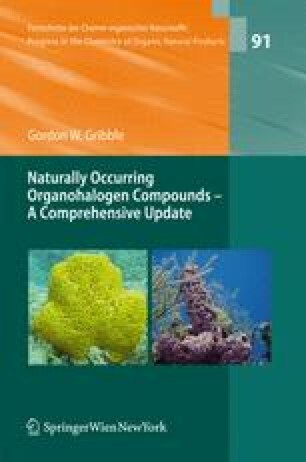 While the question of how nature produces organohalogens lagged far behind their discovery, this situation has dramatically changed since the first review (1). Numerous excellent reviews of biohalogenation are available (17, 59, 2114–2122, 2323), and, as will be seen, several new halogen peroxidases, halogenases, and other enzymes capable of introducing halogen into organic compounds are known, including fluorine. Specialized reviews on biohalogenation involving vanadium haloperoxidases (2123–2126), biochlorination (2127), biohalogenation by Basidiomycetes fungi (2128), haloperoxidases in organic synthesis (2129–2131, 2327), biohalogenation enzymatic mechanisms (2132), and halomethane biosynthesis (2133) are available. The role of hydrogen peroxide in defining the function of haloperoxidases and other plant enzymes has also been investigated (2134–2137).